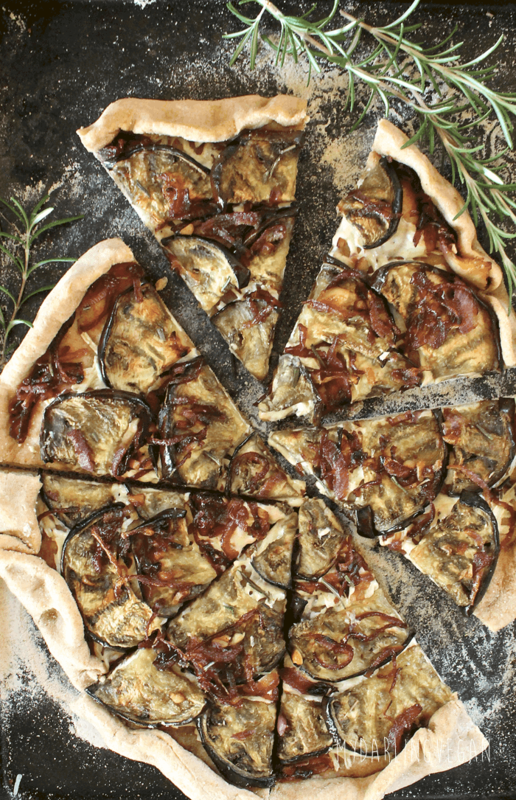 This hearty and delicious Eggplant Pizza with caramelized onions is a meal that vegans and meat-eaters alike will enjoy. Combine yeast and warm water and set aside. Mix together flours and salt in a large bowl. Add olive oil and mix. While mixing, slowly add water/yeast mixture. Turn onto a floured surface and knead for 5 minutes. Place in a large oiled bowl, cover with a damp towel, and place in a warm area for 1 - 1½ hours, until doubled in size. Once dough is ready you can begin preparing everything else. Turn the oven to broil and move an oven rack to the top shelf. Slice the eggplant ¼ inch thick and place on a parchment-lined baking sheet. Lightly brush each side with olive oil and sprinkle with salt. Broil for 4-6 minutes on each side, until lightly golden. Remove from oven and let cool. Heat 1 tbsp of olive oil in a small skillet and sauté onions until caramelized - about 10 minutes. They will be dark in color (not burnt) and fragrant. Add garlic and sauté for another minute. Remove from heat and set aside. Turn down oven to 450F. Shape the dough to fit on a pizza stone or baking dish. Lightly brush on the remaining olive oil and top with the vegan cheese. Place broiled eggplant over the cheese, covering the entire surface. Top with caramelized onions and fresh rosemary. Bake for 15-18 minutes, until the crust is lightly browned. Allow the pizza to cool 5 minutes before slicing.